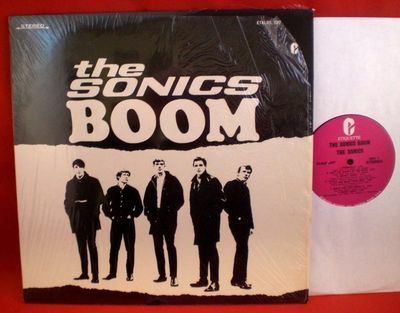 THE SONICS BOOM (Etiquette ET-ALBS 027)1966 Orig Stereo Mod Fuzz Garage Punk LP) ......Thick cardboard cover with paste-on slicks and very thick vinyl (Bootlegs and reissues are pressed on much thinner flexible vinyl and have thinner printed covers)........Second LP from Tacoma Wash. legends. Clean vinyl = VG++, close to EX with only light surface wear, plays great. Cover = M- in partial shrinkwrap , torn peeling back upper RHC and on reverse leaving the cover solid black with no ringwear! Nice copy!! CHECK OUT MY OTHER AUCTIONS FOR MORE ORIGINAL SONICS LP'S! Payment by Paypal, etc. Payment must be received in 7 Days , or I reserve the right to re-list item. WASHINGTON RESIDENTS will be charged 8.9% state sales tax. All LP's and 45's shipped in new Bags Unlimited cardboard RECORD MAILERS with two cardboard filler pads. Lp's shipped correctly with sleeve/disc outside of cover in outer plastic sleeve. I do not use envelopes or the cheap/thin postal service boxes. 45's = $3.50 (first class mail) plus $.50 per additional 45. 45's (first class airmail) : $12.00 for first 45 plus $1.00 per additional 45. Postage for Canada (First class airmail international) = $14.00 for first LP plus $1.50 per each additional LP. 45's = $8.00 (first class airmail) for first 45 plus $1.00 per additional 45.